One of my favorite things about the holiday season is the holiday parties! I l-o-v-e getting all glamorous, sipping champagne, and spending a fabulous evening with people whose company I thoroughly enjoy! New idea! Let's make holiday parties last all year! Done? Done! 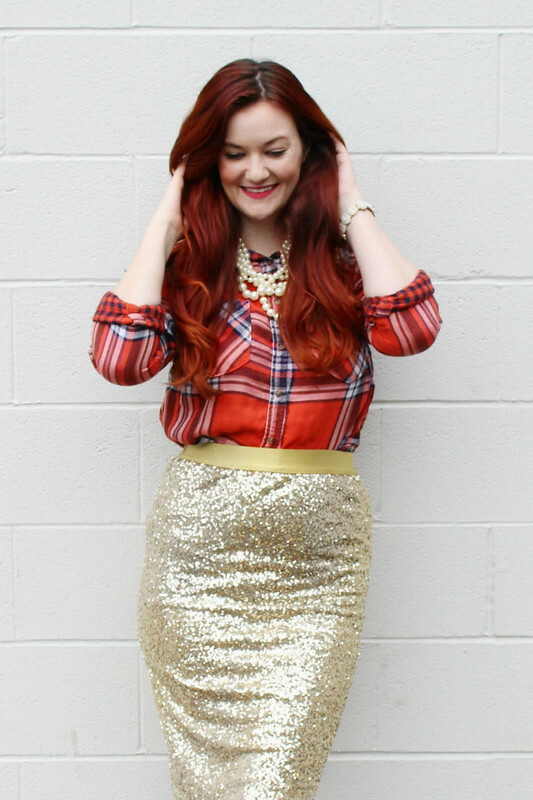 As many of you already know, I'm a sucker for a good sequin anything, but I decided to pair my sparkles with something a little less traditional...plaid flannel! What?! 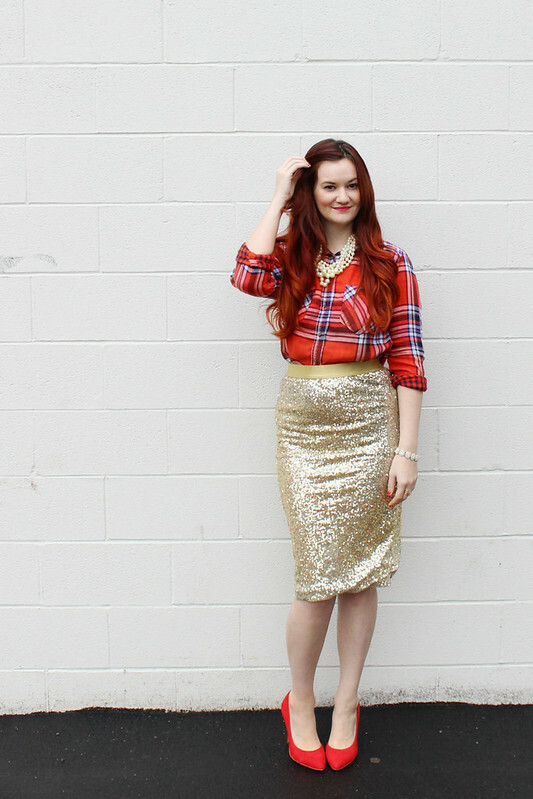 You simply cannot go wrong with a good pencil skirt. They are classic and flattering on almost everyone. They give girls like me who are basically ALL HIPS AND THIGHS a very flattering and feminine shape. 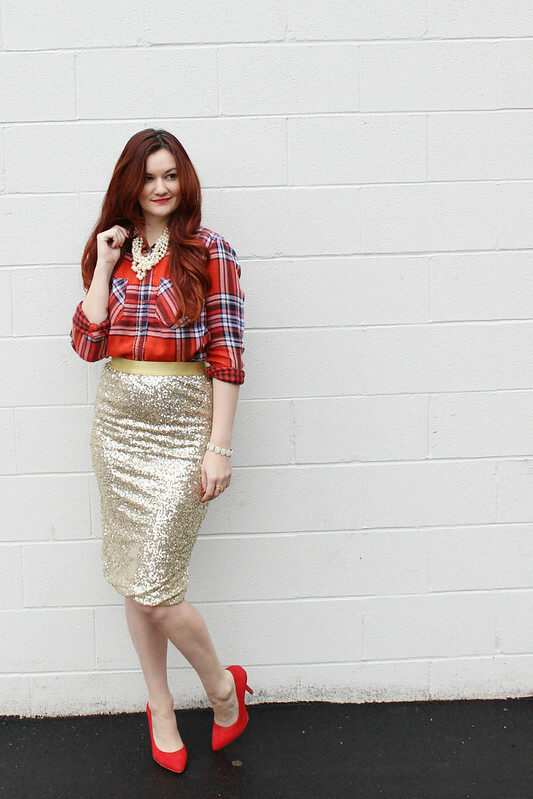 So of course when I found a gold sequined covered pencil skirt ON SALE, you know I had to jump right on it. Don't come between this girl and her sparkles! It was originally from Modcloth. They don't have it anymore, but I linked some very similar cuties below! 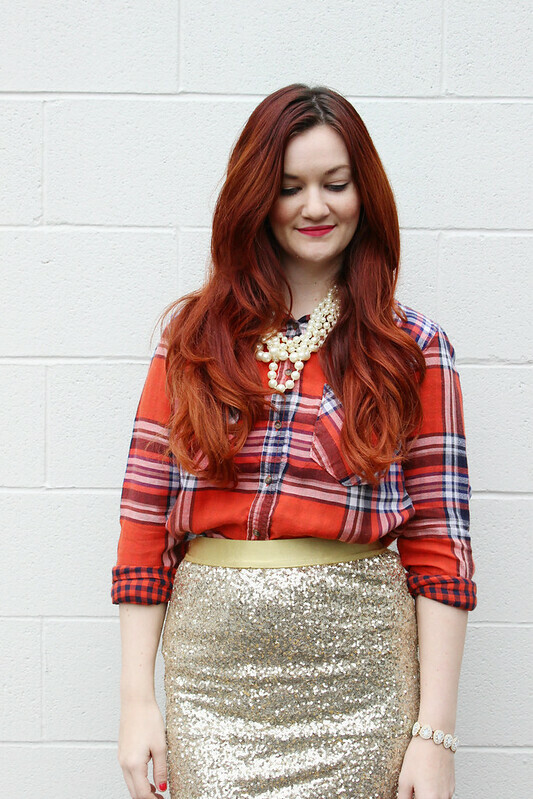 I decided to think a little outside the box and paired by glittery skirt with this plaid shirt from Target. 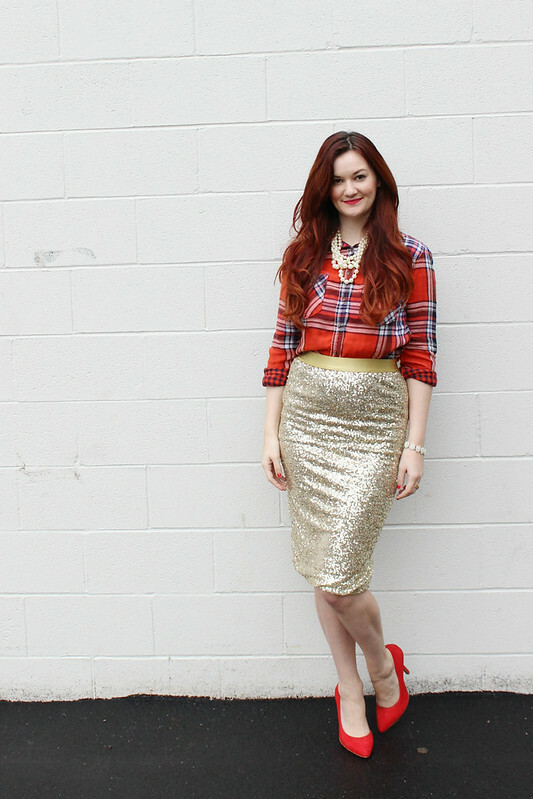 I went with a red plaid so that it worked really well for a holiday party. Nothing says timeless Christmas like a red and gold color combination. The relaxed look of the shirt and plaid pattern help to take this look to a more casual place. You don't always have to go over the top to a holiday party. Sometimes it's okay to find that perfect combination between glamamazon chic and cozy. Since I wanted to stick with a red and color color scheme, I turned to my favorite pair of red pumps. They are suede and a truly timeless shade of red. They pop really well against super pale girls like me, haha! I topped the look off with my go-to set of clunky pearls and a classic red lip. Now it's off the party! Happy Holidays, everyone!